This earth science program has students investigate the physical properties that make minerals unique, as well as the massive scale of change that occurs on Earth. Based on specific curriculum outcomes, this program gives students a hands-on activity, along with high-tech imagery, to encourage them look at geology from both a local and global perspective. Students will learn to differentiate between rocks and minerals, participate in hands-on mineral testing and have the opportunity to be introduced to Science on a Sphere. Science on a Sphere gives a perspective of the Earth as it might be seen from 45,000 km away! 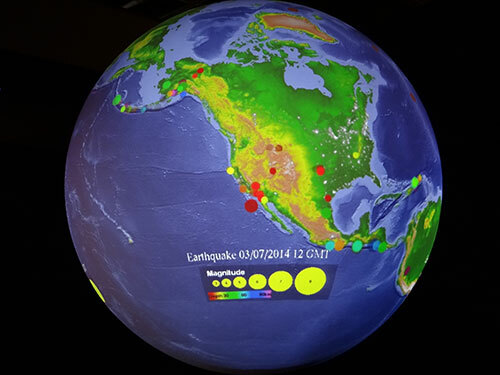 Live and archived scientific data display earthquakes, volcanoes, tsunamis and more. This technology is an awe-inspiring global projection system and the first of its kind in Canada. Outcome 7: Students will explore the characteristics of rocks, minerals, and fossils. Classify and compare rocks and minerals according to characteristics. Explore the connections among the rock cycle, soil, and weather. The program begins with a group introductory discussion and activity reviewing the difference between rocks and minerals. Facilitated through a consideration of the ingredients used in baking, the students will connect how rocks are made up of several mineral constituents. The class will be divided into two groups and take part in both of the following activities. Half of the group will be introduced to the Earth’s surface and major natural phenomena that affect its landscapes using the cutting-edge technology of “Science on a Sphere”. During the presentation, students will be encouraged to think critically about how landscapes can change and share their ideas and experiences. The show will focus on both local events, like snow, ice and hurricanes, as well as global events, such as earthquakes, tsunamis and volcanoes. In small groups, students will rotate through a series of mineral testing experiments, using Nova Scotian geological specimens. Through hands-on investigation and observation, students will record the properties of several minerals, which are commonly used for identification by geologists. In their respective groups, students will discuss and summarize the material covered over the course of their activities. This program will be offered on Tuesday mornings in April, May and June, 2019. Bookings begin in February 2019. We encourage you to book early.